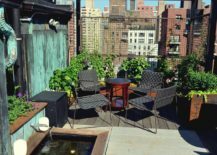 In a city as tall and compact as New York, particularly in Manhattan, rooftop spaces provide an altogether altered perspective of this crowded metropolis. 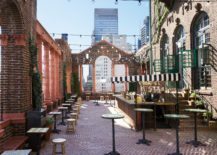 In summer months, New Yorkers and visitors alike make their way to rooftop venues, finding havens replete with sparkling views and sunny cocktails, dapper bartenders and breezy manners. 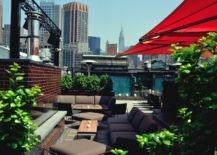 Trawl through the Web and you will hit on many rooftop bars that sit high above New York’s bustling streets. 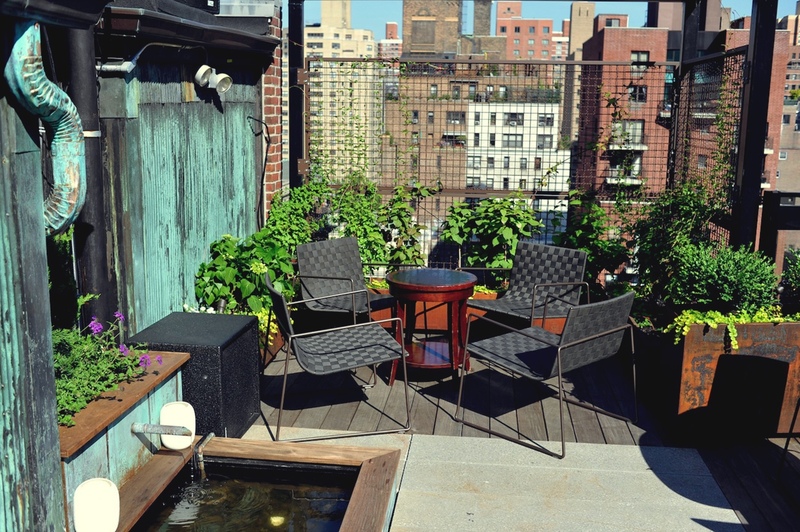 Having undertaken that very exercise, there follows a selection of fifteen happening NYC rooftops. 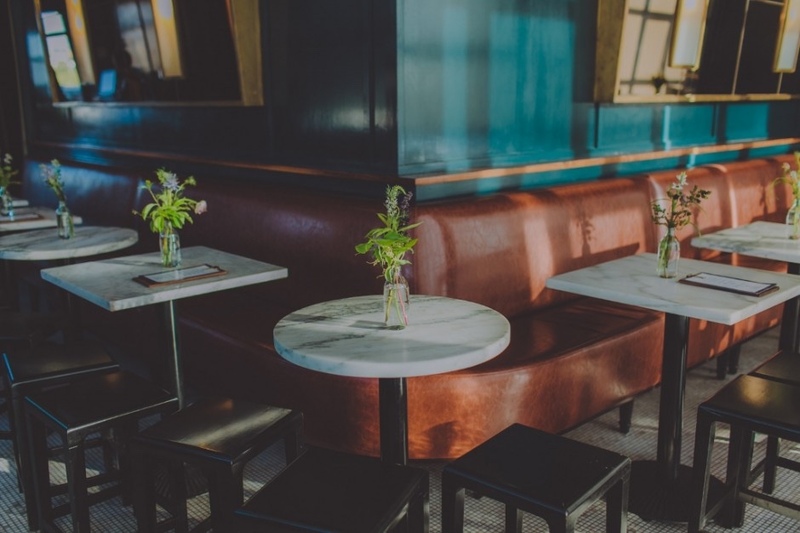 A note to the reader: venues were chosen on the basis of their aesthetic appeal, a bird’s-eye view and an honest review. 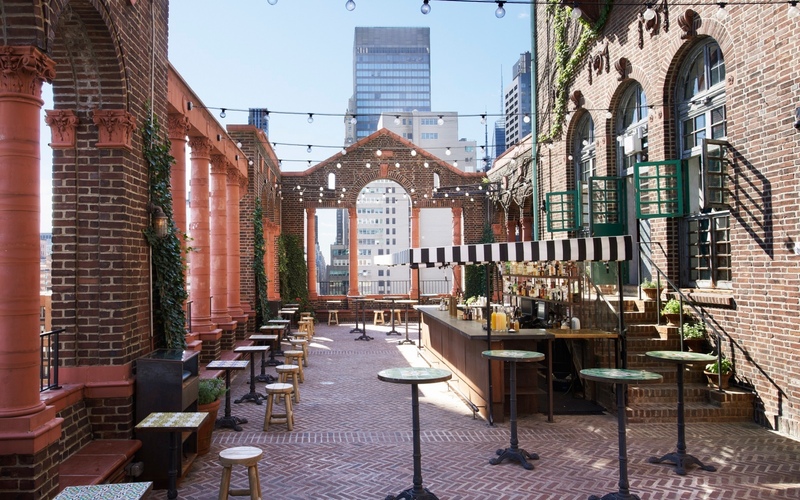 The Attic, a rooftop club and lounge combo in the Hell’s Kitchen neighbourhood of Manhattan, is designed to offer the look and feel of the Hollywood Hills. 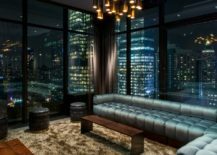 The Attic rooftop club and lounge combo. Images © The Attic Rooftop 2016. 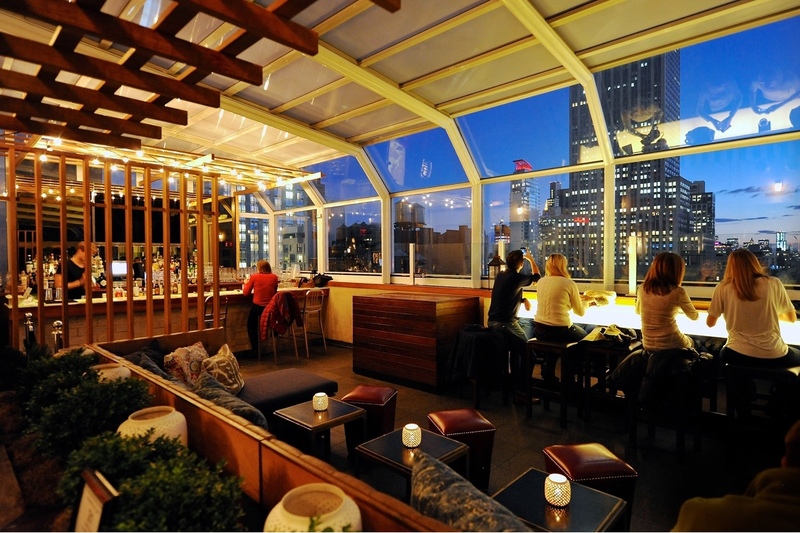 The Ava Lounge sits on top of the Dream Hotel in Midtown Manhattan. 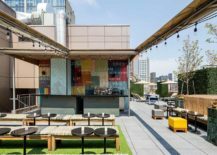 Elegant, chic, a little swanky and plush, this rooftop bar offers a chilled vibe both indoors and out. 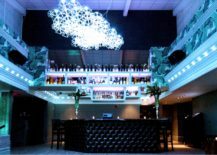 Ava Lounge indoors. 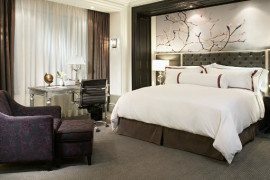 Image © Addison Hospitality Group 2016. Ava Lounge al fresco. Image © thirsty. 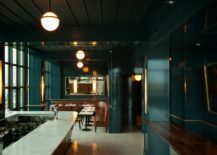 The hip Wythe Hotel is located in the Williamsburg neighbourhood of Brooklyn. 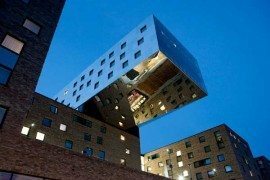 Occupying a one-time barrel and cask cooperage (constructed in 1901), the complex has been converted into a 72-room hotel that cleverly maintains the building’s industrial heritage. 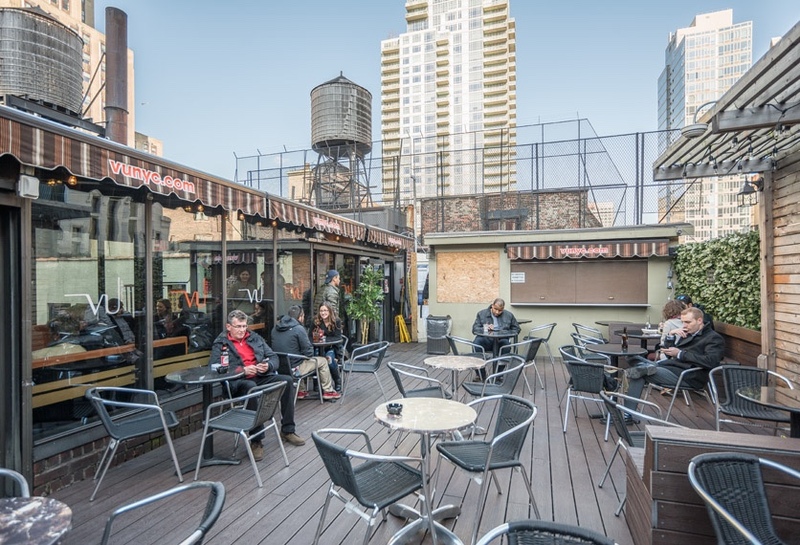 A new glass box extension accommodates the Wythe’s rooftop bar, providing sweeping views of the Manhattan skyline. 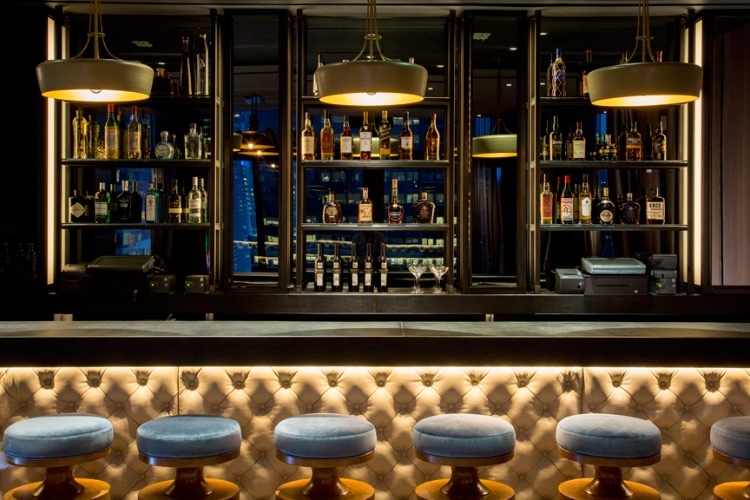 Here you will find the modish and Art Deco-style Blue Room at The Ides Rooftop. 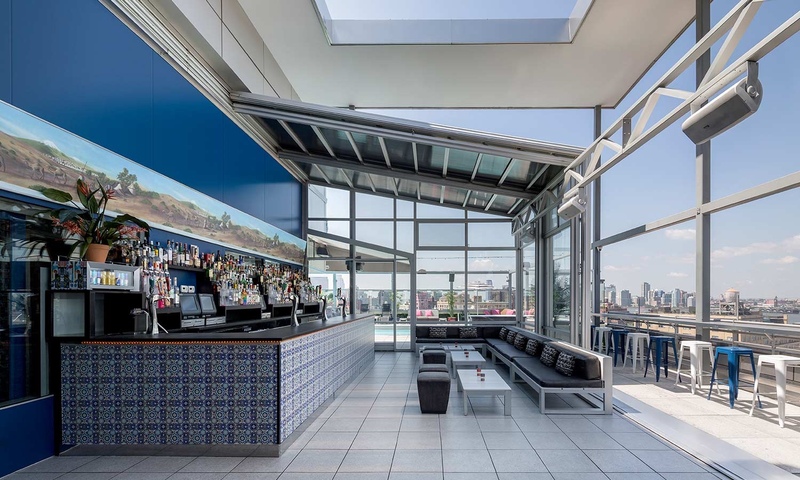 The Blue Room at The Ides Rooftop. 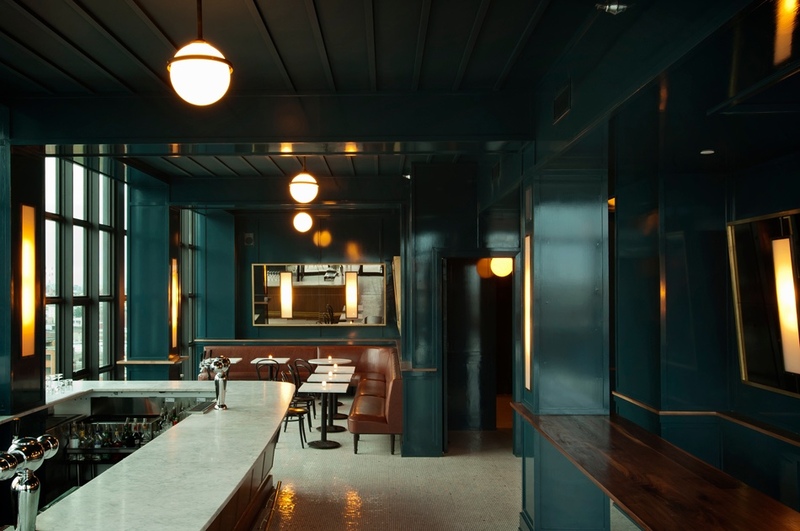 Image © Wythe Hotel. The Blue Room at The Ides Rooftop. Image courtesy of 1stdibs. 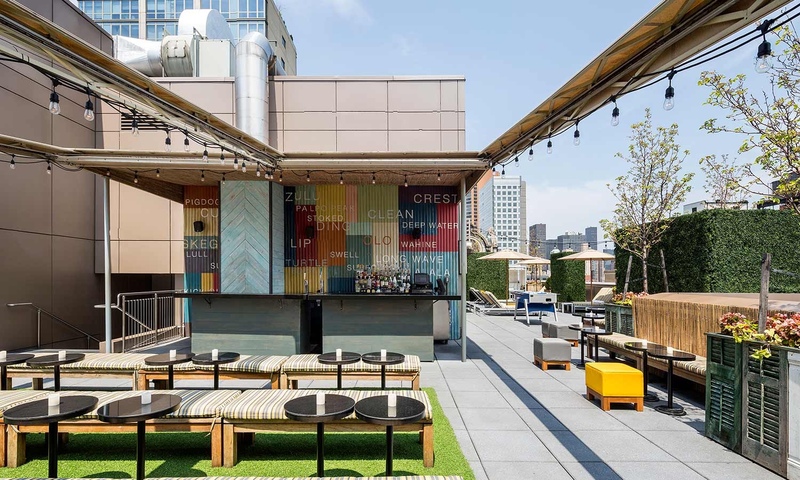 Located in Korea Town, Cloud Social is one of many NYC rooftop bars boasting blockbuster city views; its panorama extends from the Empire State Building to One World Trade Center. 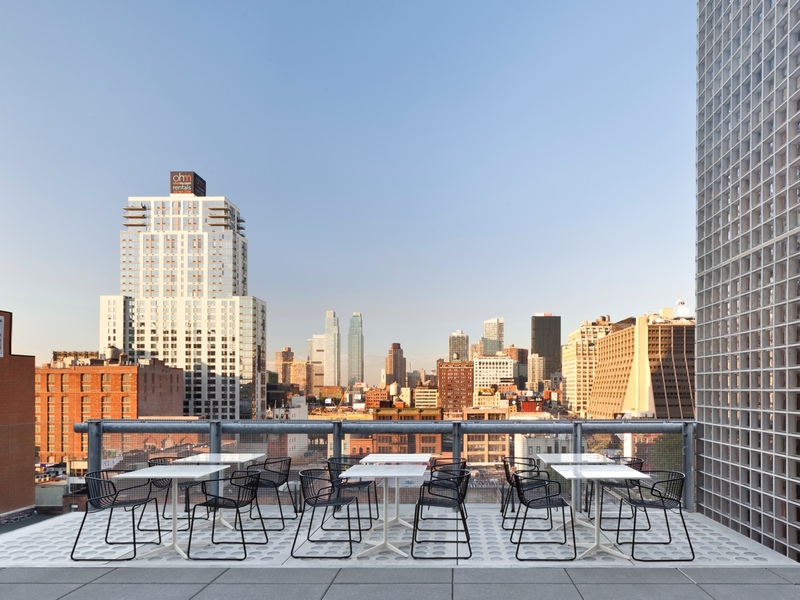 Sitting on top of the New York Manhattan Hotel, this spacious venue is accentuated with pops of orange, including Philippe Starck’s Masters Chair for Kartell. 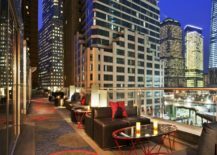 Cloud Social rooftop bar. Image © thirsty. 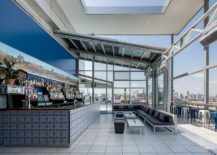 Cloud Social rooftop bar. Image © 2016 Manhattan Sideways. 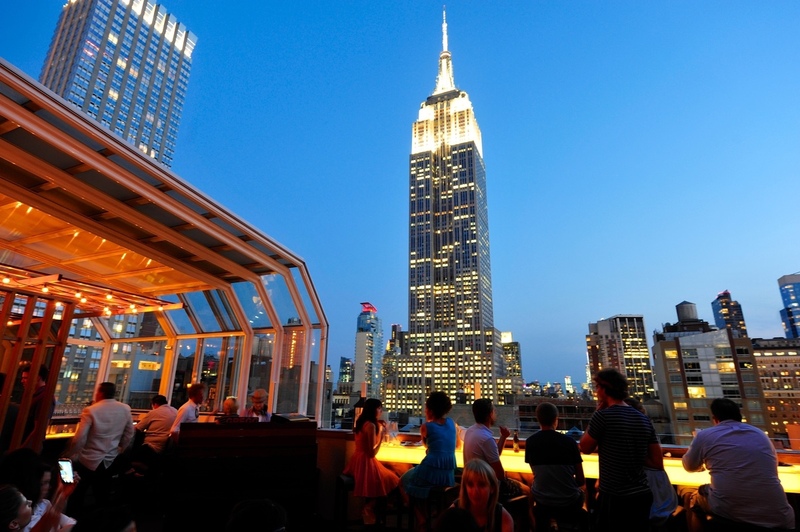 Cloud Social rooftop bar’s Empire State Building view. Image © 2016 Manhattan Sideways. 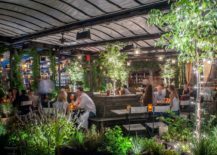 Gallow Green is the dreamy rooftop venue at Chelsea’s fictional McKittrick Hotel, the setting for Sleep No More. This kooky presentation of Shakespeare’s Scottish tragedy is delivered through the lens of a suspenseful film noir. 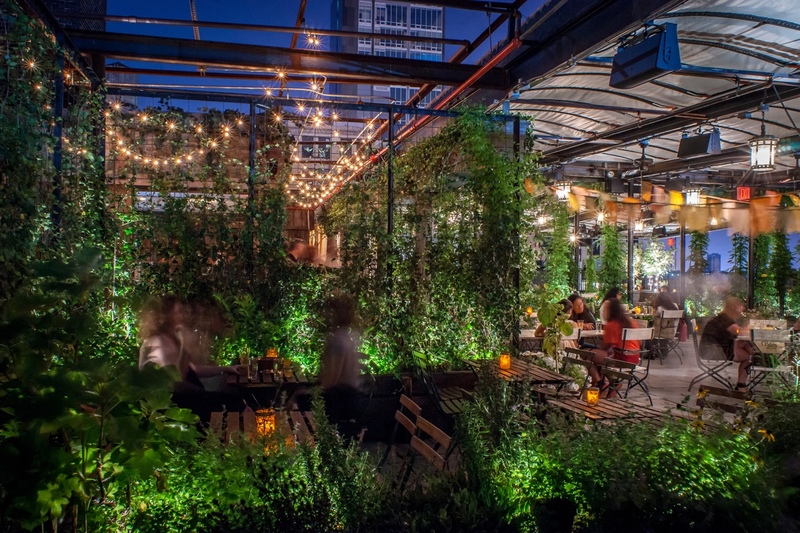 If you enjoy being part of an interactive performance (this writer’s worst nightmare), then Gallow Green is for you. 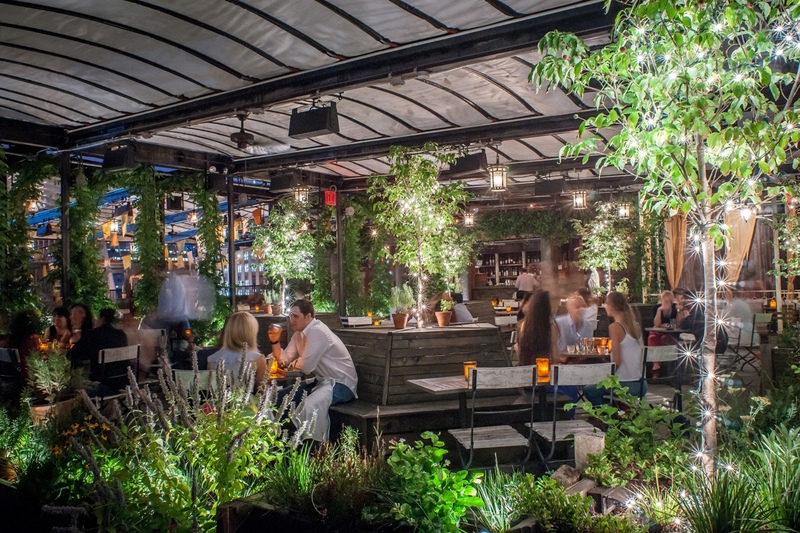 Gallow Green. 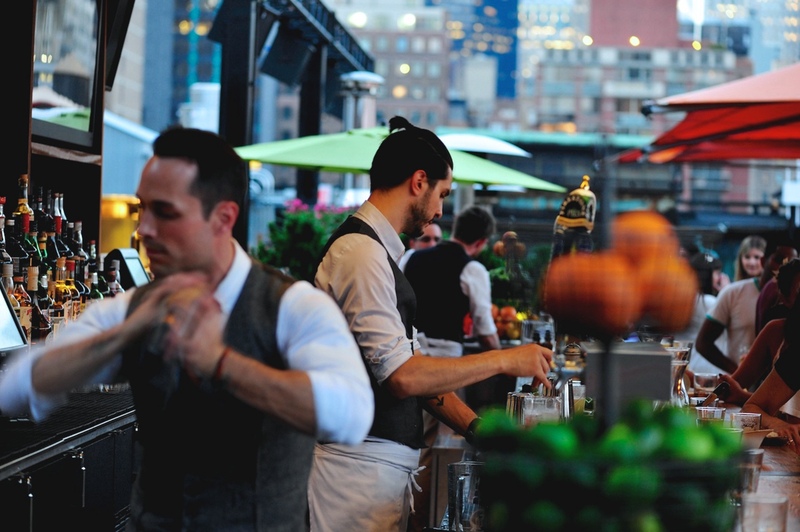 Image courtesy of O&M Co.
Gallow Green rooftop bar. Image © 2016 Time Out Digital Ltd. 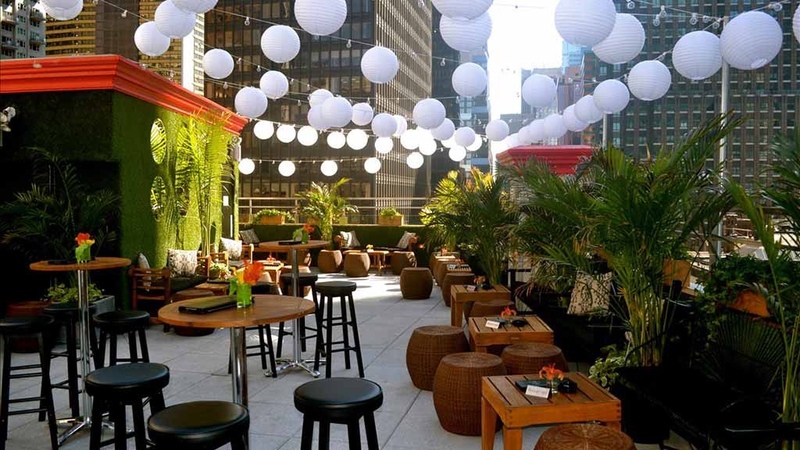 The fizzing rooftop bar at the Gansevoort Park Avenue hotel is akin to an oasis in the sky. 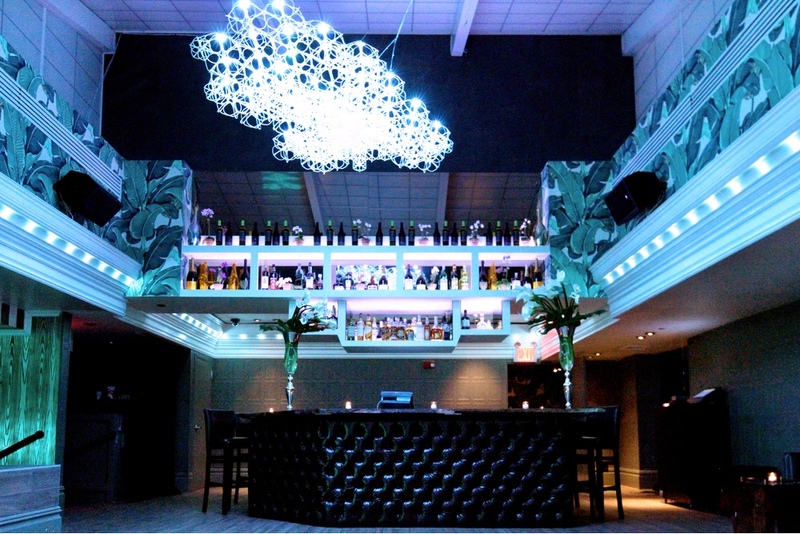 The venue is known to host an A-list crowd as well as your average joe. 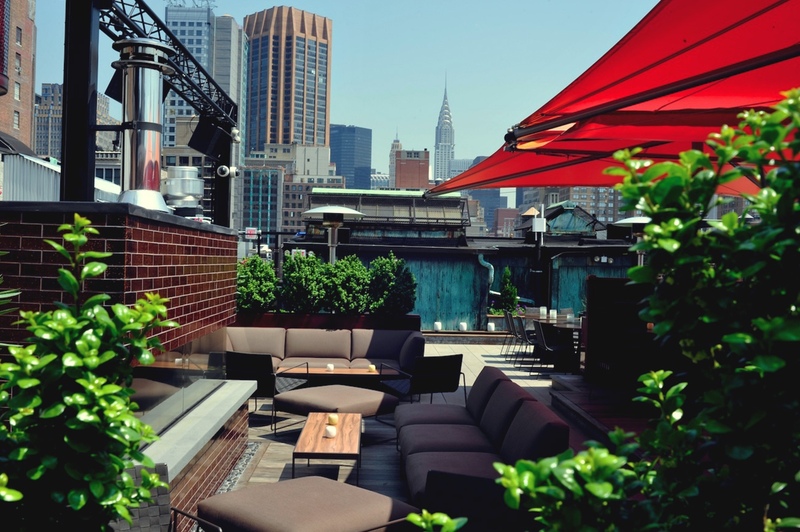 The Gansevoort Park Avenue rooftop bar. 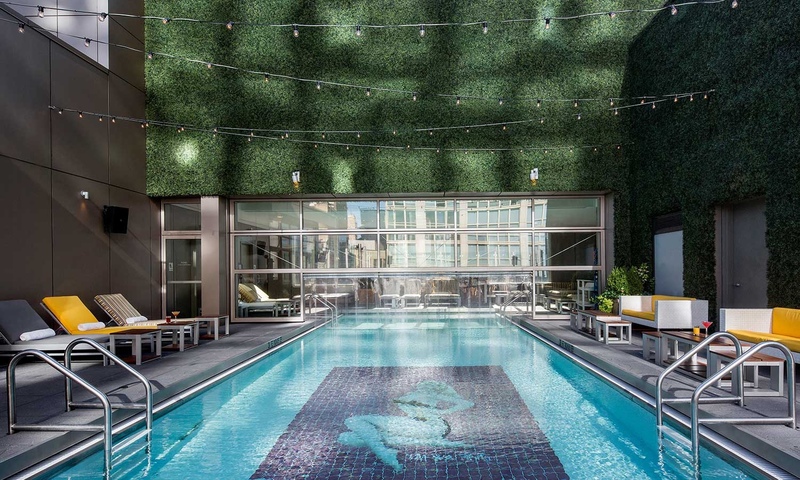 The Gansevoort Park Avenue rooftop bar pool. 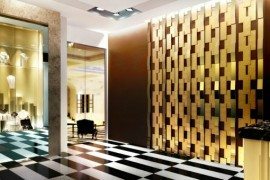 Images © 2016 Gansevoort Hotel Group. 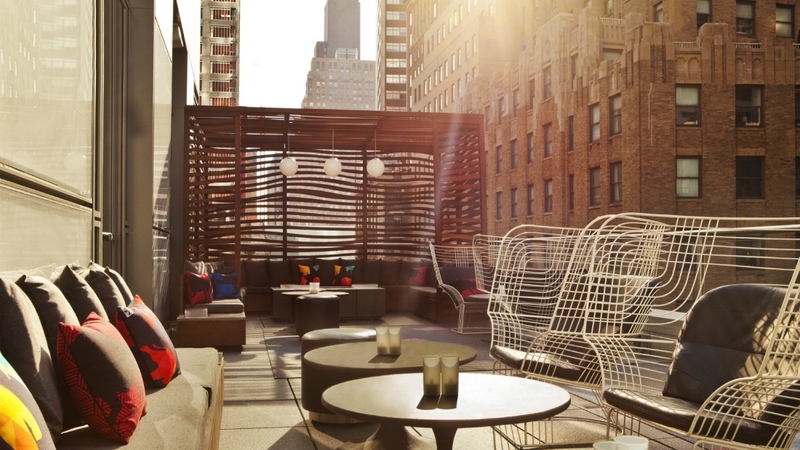 Find the handsome Hôtel Americano in Chelsea’s art gallery district, adjacent to the High Line. 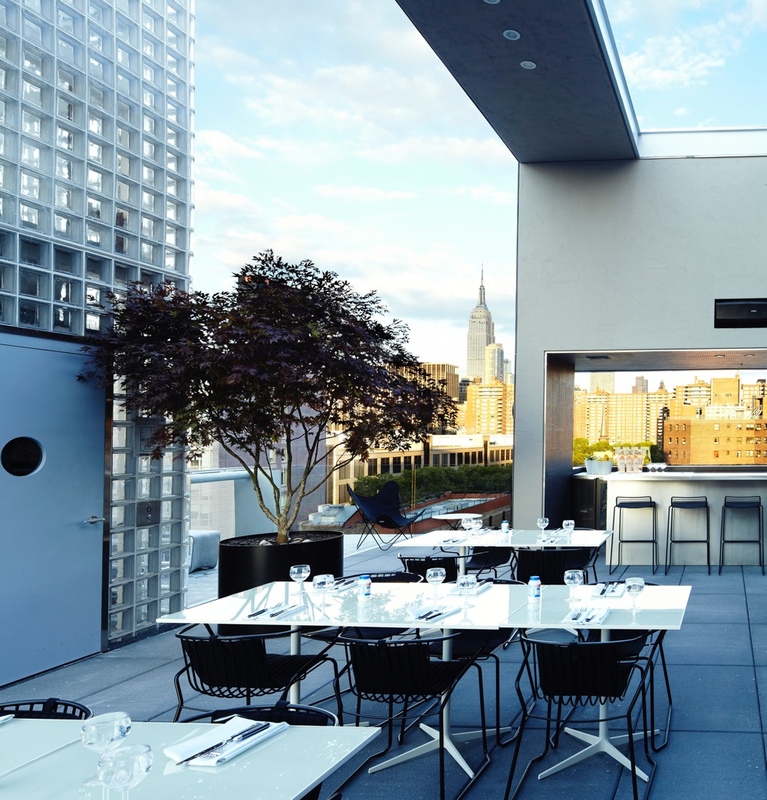 Designed by TEN Arquitectos, the celebrated Mexican architecture practice, the rooftop at Hôtel Americano is a rather sleek and well-designed affair. 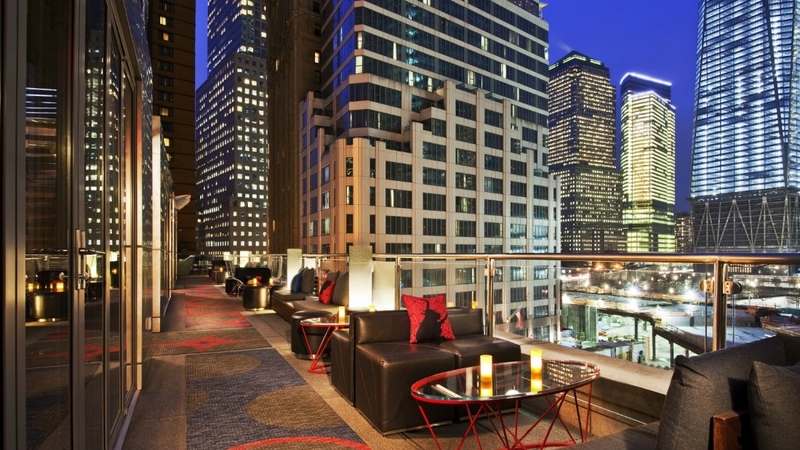 Hôtel Americano rooftop terrace. Photo by Alexander Severin. Hôtel Americano rooftop pool. Photo by Alexander Severin. 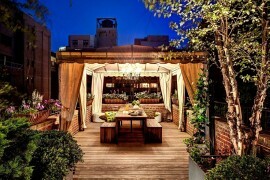 Hôtel Americano rooftop grill. 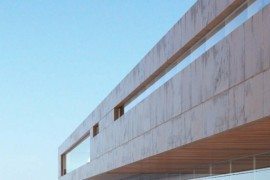 Photo by TEN Arquitectos. 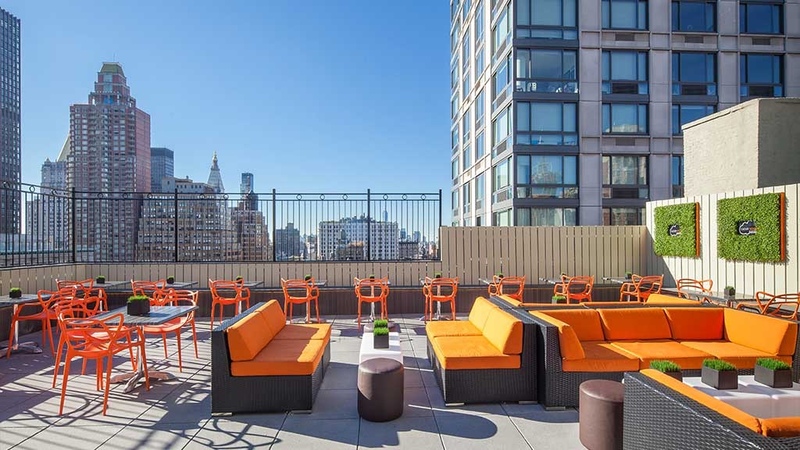 The rooftop at Pod 39, a bright budget hotel on East 39th Street, offers commanding views of NYC. 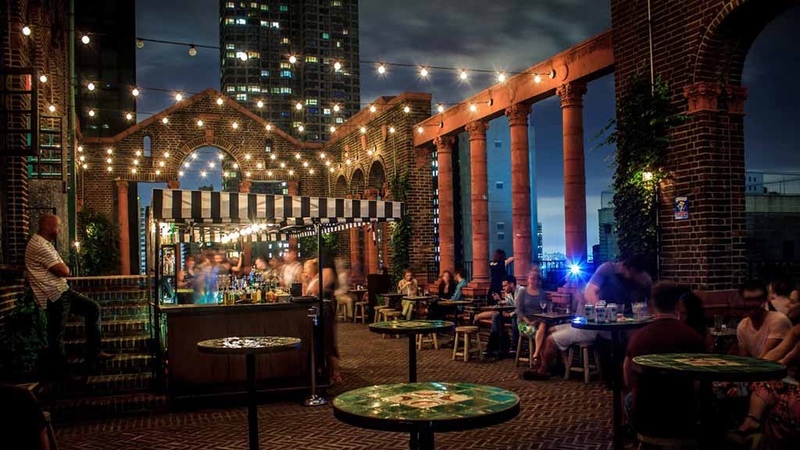 Original brick arches stand side by side with unconventional terracotta columns in this buzzing and popular high-rise bar. 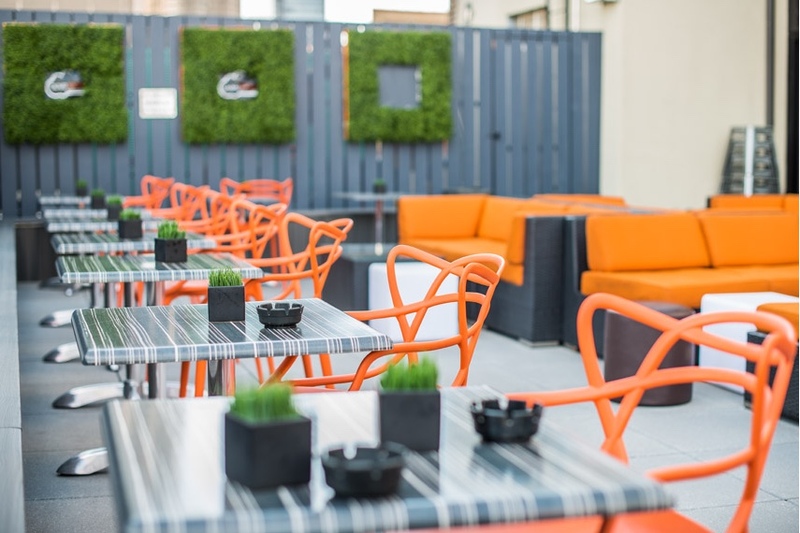 The rooftop lounge at Pod 39. 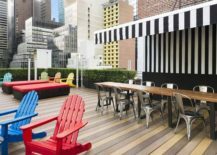 Image via Travel+Leisure © 2016 Time Inc.
Pod 39 rooftop at night. Image © thirsty. 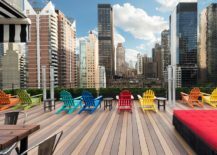 Grab one of the colourful Adirondack-style chairs on Pod 51‘s roof deck and settle down in the afternoon sun, in the company of numerous glinting skyscrapers. 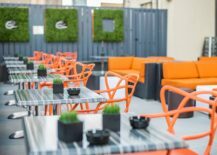 The Pod 51 roof deck is something of a DIY venture: patrons can bring along their own wine and beer from the ground-floor café. 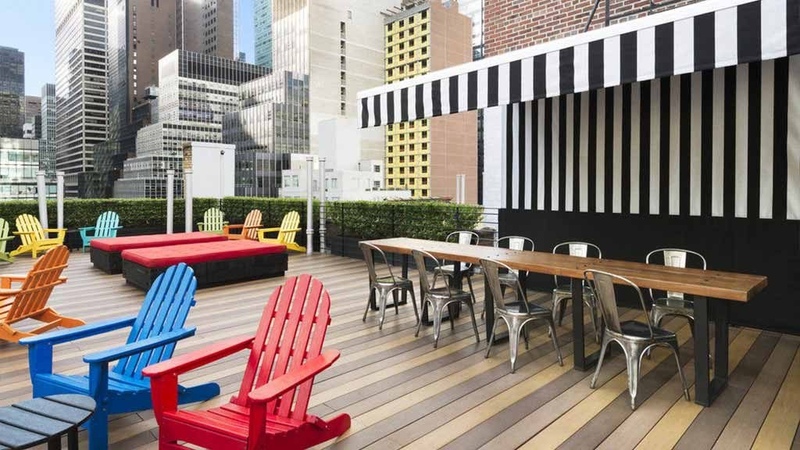 The Pod 51 roof deck. Image © thirsty. Pod 51 roof deck view. Image © Drink Me. 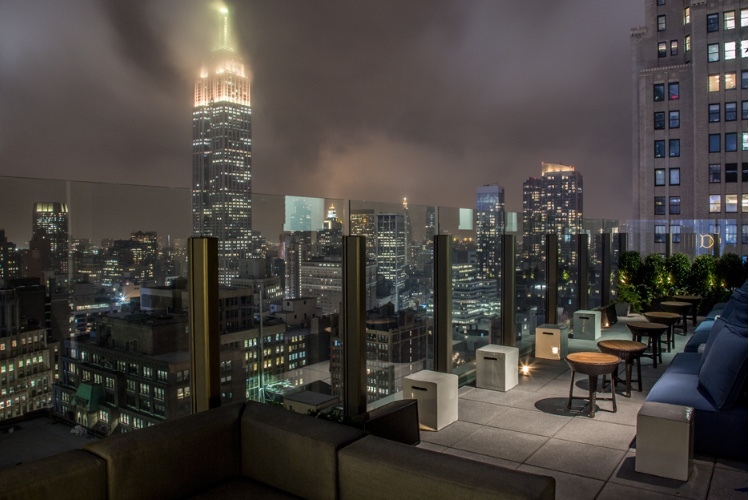 Boasting impeccable cocktails and an unobstructed view of the NYC skyline, the Roof at Park South nestles atop the Park South Hotel in Midtown. The Roof at Park South. A cosy corner on the Roof at Park South. 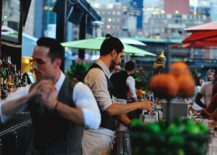 Bartending at the Roof at Park South. Images courtesy of Roof at Park South. 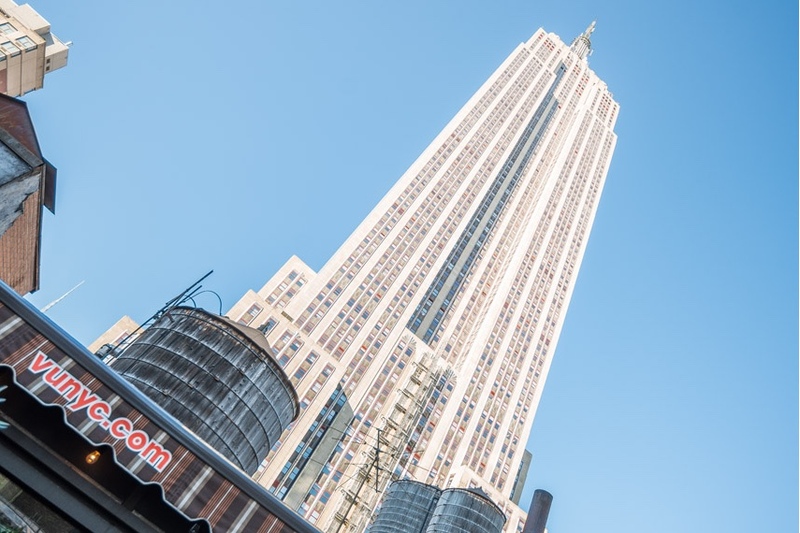 Find the classically styled Skylark in the southern vicinity of Times Square. 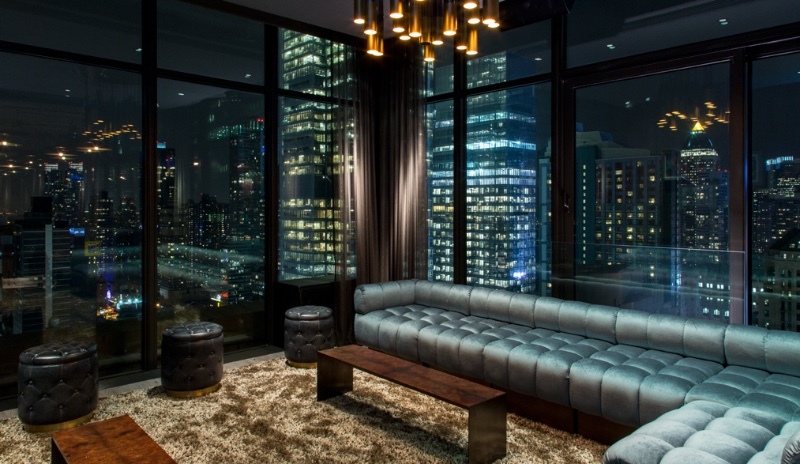 Set thirty stories up, it affords patrons unequaled views of NYC’s concrete jungle. 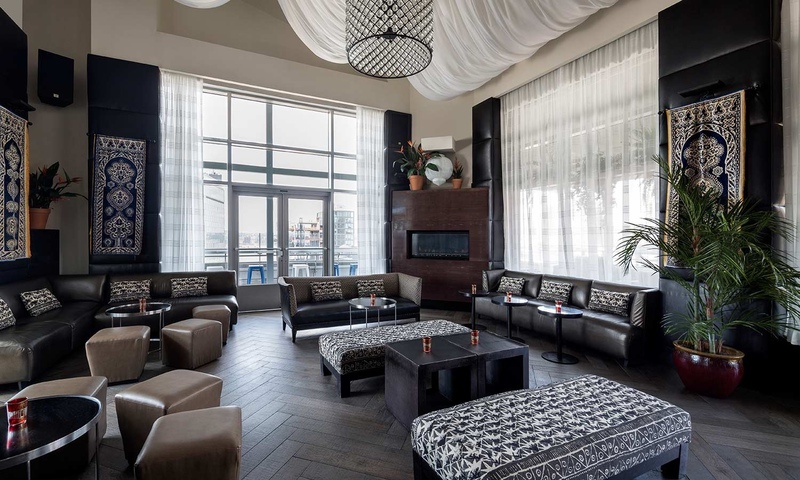 Appealing more to the affluent consumer, The Skylark is an upmarket venue with a dress code: clients should wear business or upscale casual attire (read no jeans or sneakers). 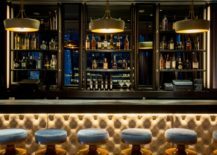 With a mixologist on hand, expect delicious and well crafted cocktails. Images courtesy of Abigail Kirsch. 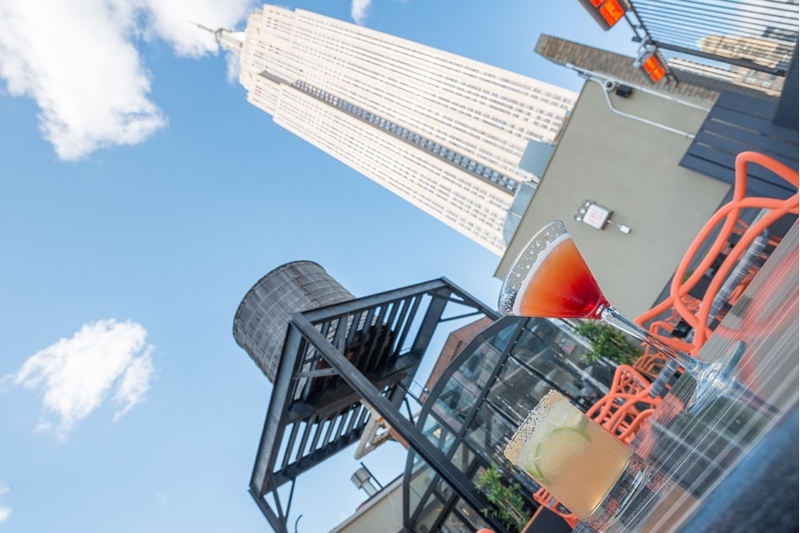 If you hanker for a clear view of the Empire State Building, then a first-come, first-served front row seat at the Top of the Strand rooftop bar in Midtown is for you. Top of the Strand rooftop bar. 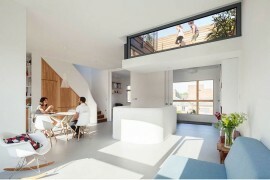 Images courtesy of Top of the Strand. 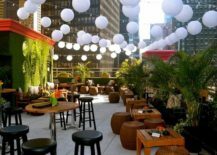 One of NYC’s more modest rooftop bars, the VU bar offers savvy customers great views of Manhattan and affordable drinks in a casual setting. 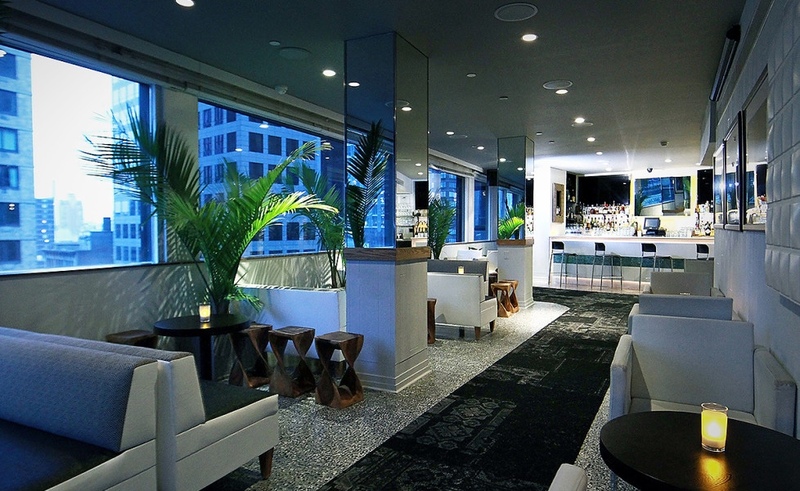 Devoid of any notable design features, the VU bar is perhaps best known for its vista and friendly neighbourhood vibe. Images © 2016 Manhattan Sideways. 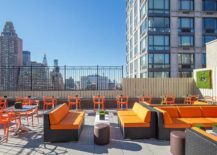 “Boutique” hotel chain W’s downtown accommodation is surrounded by a variety of NYC icons, from the Statue of Liberty to One World Trade Centre. Enjoy them all from its rooftop terraces. 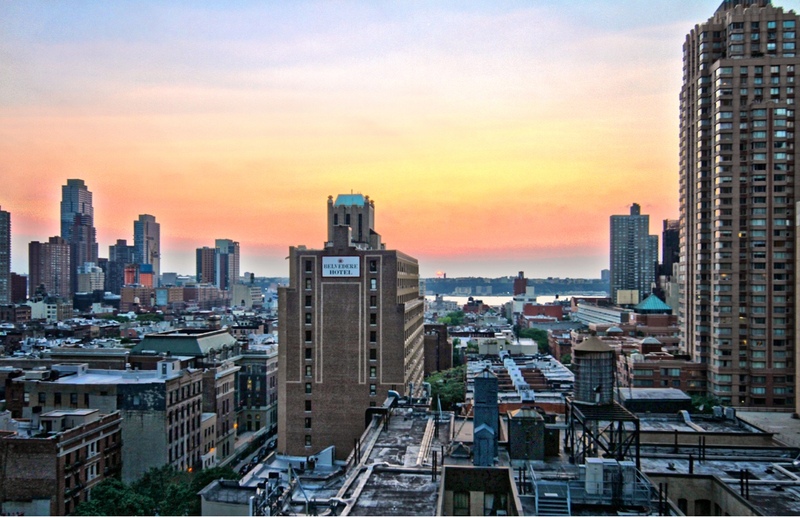 Images courtesy of W New York – Downtown. 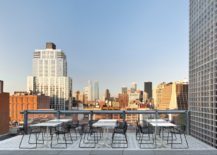 A rooftop bar at the Gansevoort Hotel Group’s Meatpacking District venue, Zerzura at Plunge enjoys views over Manhattan and the Hudson River. 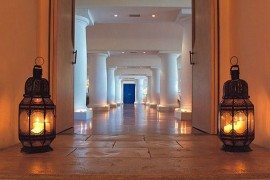 Named after the mythical desert oasis, Zerzura is imbued with a Moroccan aspect, including blue and white tiles, desert murals and handmade tapestries from Marrakech. 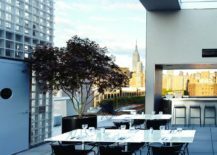 Zerzura at Plunge, Gansevoort Meatpacking District.